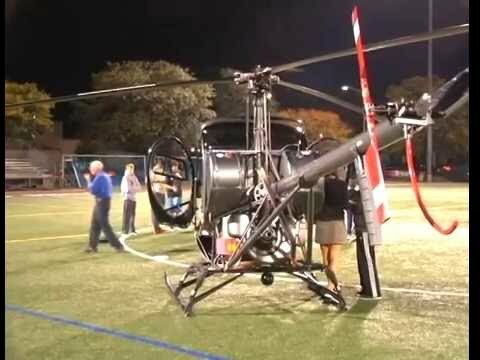 A black helicopter after making an emergency landing in an OPRF athletic field on Monday. | Photo submitted. Some Oak Park residents were caught off guard on Monday after a black helicopter made an emergency landing inside Oak Park and River Forest High School's track and field complex on Lake St. and East Ave.
"I arrived at the OPRFHS field Monday evening at 8 p.m. for a little exercise and found the gates pad locked with a couple joggers milling around," said Oak Park resident Charles Raymond, who was on his way to the complex for an evening walk when he saw the scene. "When I asked why the gates were closed, they said, 'Look at the middle of field.' After focusing, I could see a black helicopter sitting in the field with a couple of people with flashlights." Raymond noted that the joggers told him the helicopter had to make a "hurried landing and that it came down very fast, losing its rotating blades." He said after seeing the helicopter, he went home and returned to the field with his 11-year-old son Trevor and a camera phone, which they used to snap some photos of the strange scene. "We could see the copter being pushed from the center of the field to the corner, where we snapped some photos," Raymond recalled. "There was one police officer and some OPRF employees repositioning the copter." Officials with OPRF and the Oak Park Police Department confirmed that no one was injured during the emergency landing but that the complex was cleared out while authorities prepared for the helicopter to get towed away. "It just disappeared sometime between that night and the next day," Raymond said. Supposed to be FAA numbers on it. Where are they? It's a Schweitzer.. This is, for the most part, a training helicopter. Nothing stealth about this. Probably lost power for some reason and autorotated to the ground. Nothing to see here. Though, nice machine! Well since parking is out of the question some residents have taken to other means of transportation. Thinking out of the box? Does anyone know the origins of the helicopter? I heard what sounded like several helicopters buzzing around, very low flying, on Monday night.